we can help manage your metallic waste today. An easy fit for your facility. And money for charity. 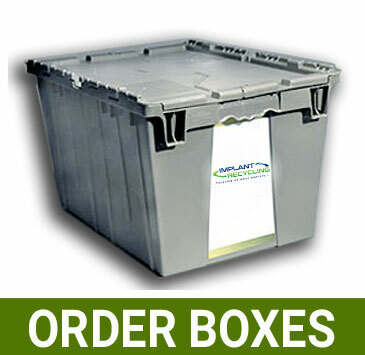 Implant Recycling will provide your medical facility with a free recycling container. 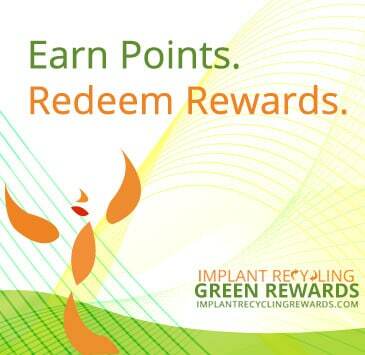 When your container is full, Implant Recycling will arrange a pickup free of charge. Implant Recycling’s environmental consults will conduct a material flow analysis and waste stream audit free of charge (optional). Based on the audit and analysis results, Implant Recycling will assist you in developing written procedures to be included in your facilities operational guidelines manual (optional). A CD containing patient consent forms—created by a leading legal expert—to recycle explanted medical implants and/or devices will be provided free of charge. Minimize your risk. All material received by our company will be resterilized to assure compliance prior to melting. This is something your local scrap yard is not prepared to do. Approximately 30 days after receiving your material, a check will be mailed to a charity of your choice. Implant Recycling activities have resulted in more than 100 charities receiving supporting funds, including those of participating hospitals.